Relative Weight Analysis is a useful technique to calculate the relative importance of predictors (independent variables) when independent variables are correlated to each other. It is an alternative to multiple regression technique and it addresses multicollinearity problem and also helps to calculate the importance rank of variables. It helps to answer " Which variable is the most important and rank variables based on their contribution to R-Square". When independent variables are correlated, it is difficult to determine the correct prediction power of each variable. Hence, it is difficult to rank them as we are unable to estimate coefficients correctly. Statistically, multicollinearity can increase the standard error of the coefficient estimates and make the estimates very sensitive to minor changes in the model. It means the coefficients are biased and difficult to interpret. It creates a set of new independent variables that are the maximally related to the original independent variables but are uncorrelated to each other. Because these new transformed independent variables are uncorrelated to each other, the dependent variable can be regressed onto this new set of independent variables producing a series of standardized regression coefficients. To calculate raw relative weights as percentage of R-Square, divide raw relative weights by r-square and then multiply it by 100. *Specify a path where INPUT DATA FILE is saved. FILE HANDLE Datafile /NAME='C:\Documents and Settings\Deepanshu\My Documents\Downloads\examples\RWA Data.sav'. *Specify a path where you wish OUTPUT files to be saved. FILE HANDLE Directory /NAME='C:\Documents and Settings\Deepanshu\My Documents\Downloads\examples'. *Define VARIABLE LABELING for Independent variables. *Order of variable labeling and independent variables must be same. *Space in labels should not be used, rather words separated by"_". /columns sequence =[RALL CALL LALL]. RECODE var6 (1 THRU HIGHEST=1) (else=0). GET FILE = corr.sav . SELECT IF rowtype_ = 'CORR' . COMPUTE LAMBDA = EVEC * DELTA * T(EVEC). COMPUTE LAMBDASQ = LAMBDA &**2. COMPUTE BETA1 = INV(LAMBDA) * RXY. COMPUTE RAWWGT = LAMBDASQ * BETA1 &**2. COMPUTE IMPORT = (RAWWGT &/ RSQUARE) * 100. /TITLE = "Raw Relative Weights" . /TITLE = "Relative Weights as Percentage of R-square" . / Rename = (COL1 = RSQUARE). FORMATS RAW_RELATIVE TO RSQUARE (F8.6). 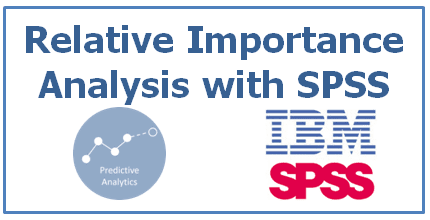 5 Responses to "Relative Importance (Weight) Analysis with SPSS"
Thanks for this interesting post. Could you please post an example of processing, say a 3 x 3 correlation matrix ? Thanks a lot. This is very helpful. May I know how to revise the syntax if the raw data is a correlation matrix?